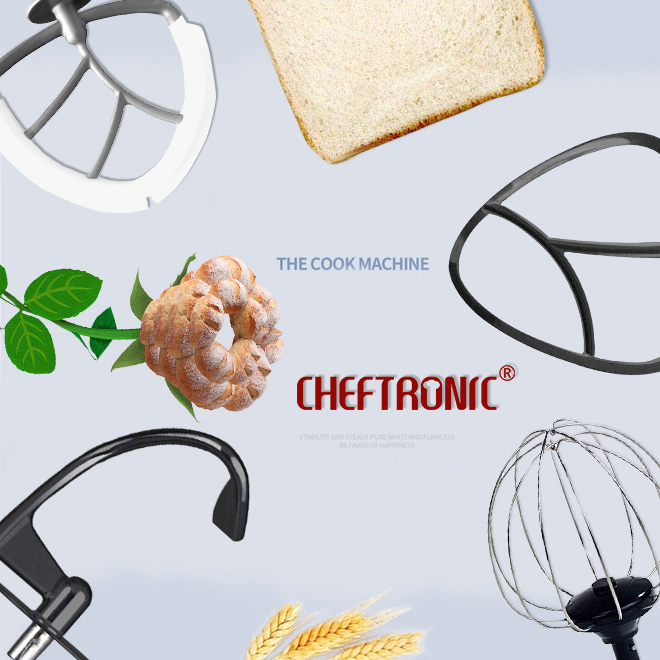 VERSATILE ATTACHMENT SET: Comes with Dough hook, Flat beater, Wire whip, Flex edge beater, Meat grinder, Blender, Sausage maker, meet all you need in kitchen, great for the new baker to the experienced baker. 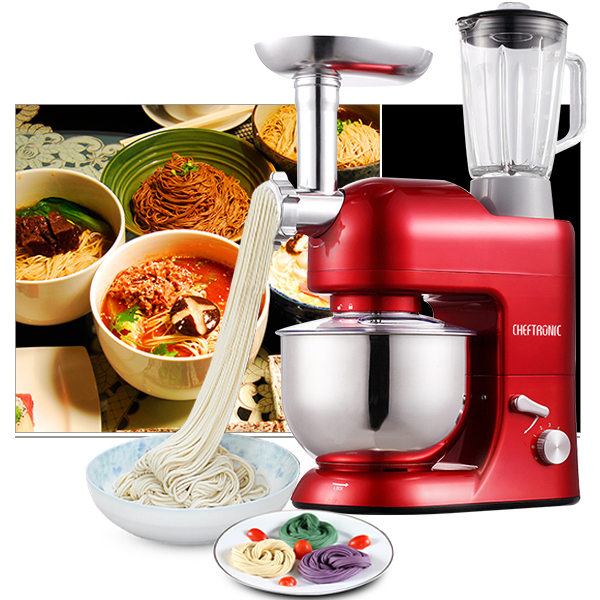 CHEFTRONIC DELUXE STAND MIXER: 3 In 1 upgraded stand mixer with detachable grinder and blender, also pasta/sausage maker, it not only saves your time and energy but also saves space on your kitchen counter. 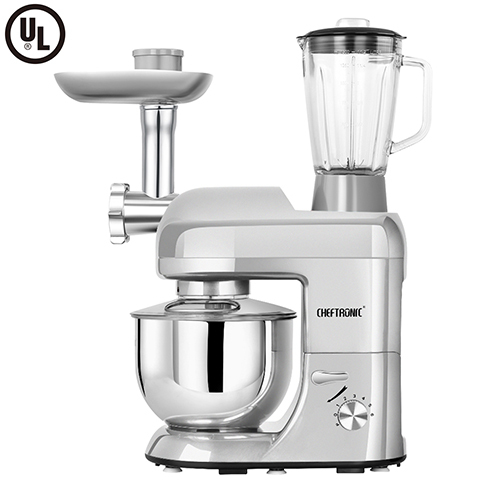 SECURITY CERTIFICATION & WARRANTY: UL standard stand mixer & 2 years manufacturer warranty. Safety protection, when the stand mixer is overheated, it will stop automatically till it cools. Baking is an art and to do that properly you need a mixer like this made some bread cakes and bread rolls and have been impressed with the CHEFTRONIC mixer. It's not noisy and mixing quite delicately turning good ingredients into great bakes. Incorporating a stand mixer with 5.5qt bowl, a glass blender jug AND a meat grinder with sausage maker attachment, this could be the most useful kitchen appliance EVER! 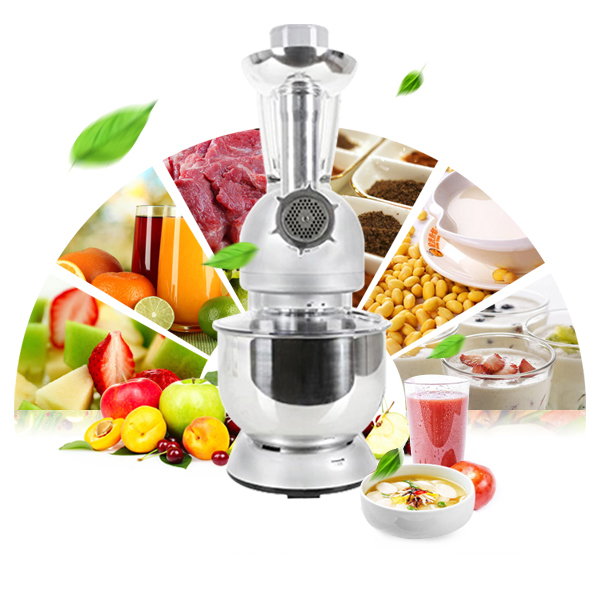 Designed for high-performance home mixing, this outstanding food preparation machine gives fantastic results time after time. The 5.3qt stainless steel mixing bowl with 6 speeds easily mixes, kneads and whips your favorite ingredients. 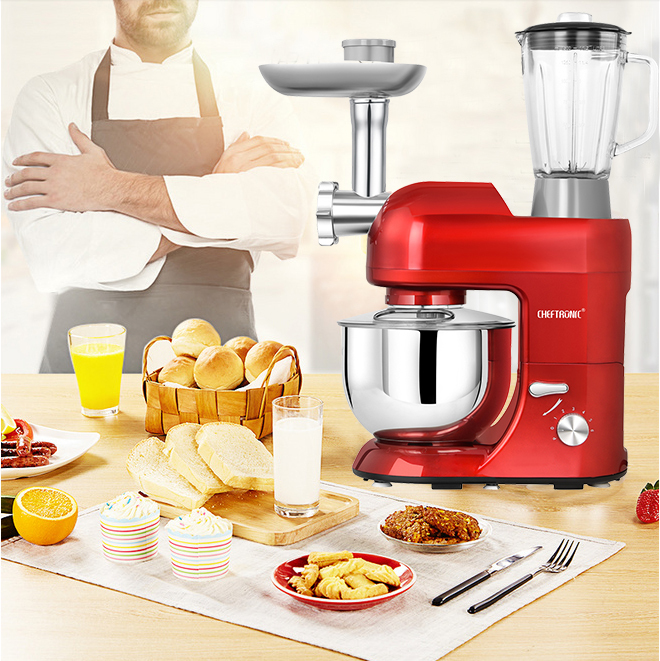 For even more versatility, the mixer is designed to use the motor's power to operate optional attachments including: juicer, meat grinders, sausage maker and pasta maker. 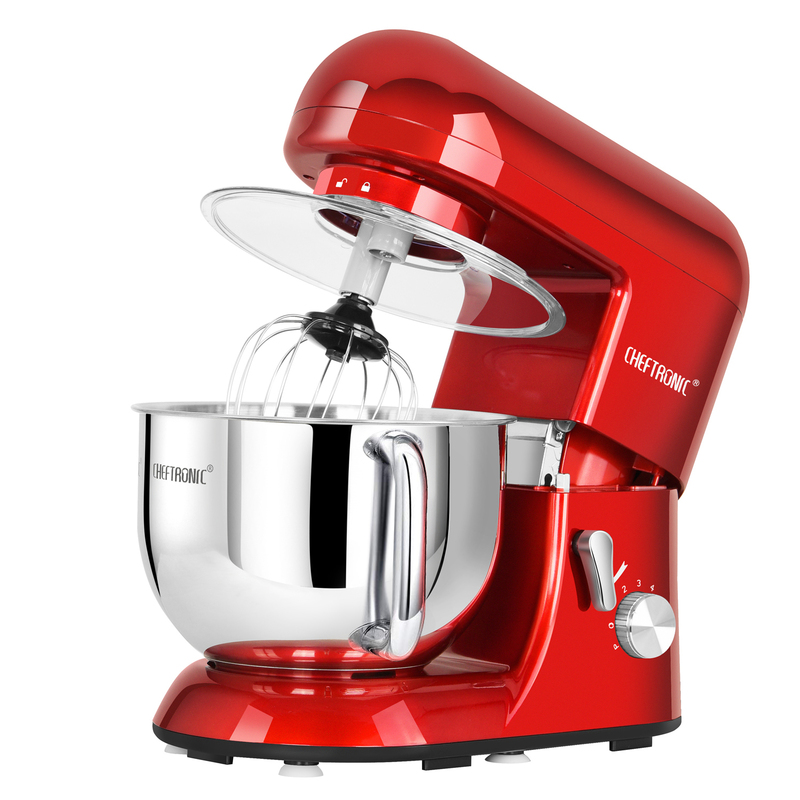 This fabulous mixer makes light work of cake, batters, sponges and meringues, thanks to a powerful 650W motor, whisk beater and dough hook system to ensure improved mixing results in less time. Please turn around the bottom foam packaging and check it carefully, the food mincer is here. 1 x Flat beater—Aluminium Alloy, great for mixing such as cake batter and sauces. Electric Meat Grinder features a powerful motor and robust stainless steel cutting blade. Take control of what goes into your food and make your own mince, sausages and kebbe at home. (Wipe metal parts with a little vegetable oil before storing to keep your meat grinder in the best possible condition.) 1.5L blender Jug perfect for those summer days when blend fruits and vegetables, nuts, seeds and ice in the cup for delicious cool, smooth nutrient and vitamin drinks and smoothies, which extract all of the nutrients from your food helping you to achieve the healthiest lifestyle possible today. Nothing tastes better than fresh authentic homemade pasta and learning how to make fresh pasta couldn’t be easier! Easily make 3 pasta shapes, lasagne, fettuccine, and tagliolini. Start enjoying pasta and impress your friends and family with your homemade culinary creations. How do I take the plastic base off of the blender for cleaning? The glass jar can’t separate from its base, you could rinse with water to clean it. The blade is very sharp, please handle it with care while cleaning. Can the blender or grinder grind beans or tomatoes to paste? You could use the mixer beater blade to grind tomatoes. The beater blade is perfect for quickly and thoroughly mashing potatoes, mixing cake batter and cookie dough and so much more. Here you need to purchase the coffee grinder to grind beans. 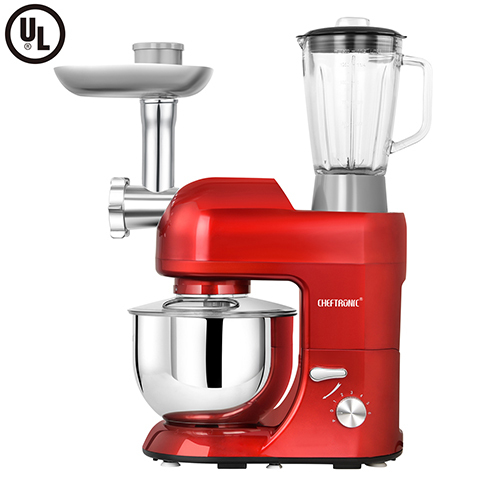 Guys: I've been wanting and waiting to purchase a quality mixer, but they all seemed so expensive, and honestly speaking, based on many of the Amazon reviews, even these expensive standard mixers (e.g., Kitchen Aid etc). seemed to have a lot of problems with build quality, the gear shafts breaking etc. after a few months of use. Then I came across this little beauty on Amazon...after doing about a week of research (and watching some sorta hokey but fun YouTube videos of folks using this product), I took the plunge (total cost on Amazon was $189, including shipping and tax). That's really unbelievable since this also includes all the special beaters and whippers AND a heavy duty blender (which I didn't necessarily need, but it's nice to have and can remain detached) AND a meat grinder (which I always wanted) and pasta maker (these attachments alone cost well over $200 for the &quot;other&quot; mixers and are sold separately). Well, it's a bit bigger than I imagined, but that's not a problem...they likely need the size to properly encase the motor and all the gears that support the additional attachments. But it is a beauty....It's a race car metallic red which looks great in any kitchen (especially stainless steel LOL), and fits under the shelf without the attachments (they include these really nice fitting covers when the attachments are not in use...cool). The base also has four suction cups that keep the mixture secure when it's being used. Again, really nice thoughtful feature. This machine was designed really well. I've used the dough hook for bread and it works very well...I don't mix &quot;hard&quot; dough, more like pizza dough, but the dough hook does the job. Excellent. I've also used the meat grinder attachment and again, it does the job well (like most meat grinders, it handles cold, firm meat better and grinds nicer (I like blending beef and chicken thighs for burgers). The only slight pain is taking apart the meat grinder for proper cleaning...it's messy and you obviously need to be super careful with that mincing blade. But this is not the fault of the design, this is just par for the course when grinding meat in any home grinding machine. I keep all the parts in a Ziploc bag when I'm done since there are a lot of little attachments that are needed when you putting together the blades for grinding). I haven't made the pasta yet, but it seems like it should work fine without any problems. A few cons here that aren't a big issue for me. 1. Not a hugely well known brand, so I don't know the longevity of this baby. It could have some of the same design issues that the pricier other models have , but at least I'm not paying close to $500 for a mixer with the attachments I need. 2. Like I said, this is a sort of big machine so make sure you have the counter space for this..you will want to display it, it's a beauty. So I will report back after I've had a few weeks to use this baby and send it through some additional trials runs. So far, very happy with this purchase. This stand mixer is very nice plus I love the extra functions. My favorite part about it is that it's so easy to use for making pasta. I put 2 -1/4 cups of flour and 4 large eggs in the bowl and it's mixed in a minute or two. Then I feed it into the grinder on top and the noodles come out in the shape of the metal attachment I have on. I put them directly in boiling water for about 4 minutes, add a little tomato sauce, and it's lunch! I can have a plate of homemade pasta ready in about 15 minutes or so. Love that. It comes with 3 circular metal attachments for different sizes of noodles. It also comes with circular plastic attachments (took a pic so you can see). The mixer comes with several different attachments as well for different types of mixing. It has one just for dough, a regular paddle one, a paddle one with a scraper, and the whisk one. They are very easy to take in and out. The mixer is absolutely amazing - for years I've only done hand mixing so this is incredible to watch how fast it is. The blender is beautiful (made of thick glass) but it seems to be in an awkward place if you leave it sitting up there while trying to use the other functions. Fortunately, it also comes with a piece that locks in place if you want to take it off completely and use the other functions without it. As a safety mechanism, the machine won't turn on unless the blender is locked on it or you have that alternative piece in place. It is a simple design and for power you just have that knob on the front that goes through 6 different power settings. I got the red one and it's a very nice kind of metallic corvette kind of red. Very happy with purchase and am going to have loads of fun with this thing. This mixer gives you just about everything you would need. It works great as a mixer giving you 6 speeds to choose from along with a pulse option. 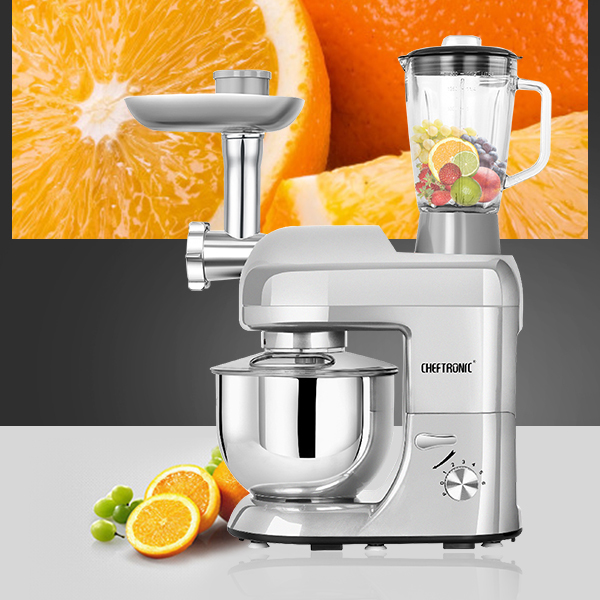 It also comes with a Glass Blender which takes advantage of the 6 speeds depending on what you are blending. And the meat grinder can be attached in seconds allowing you to grind your meats in different ways depending on which attachments you choose. There are also suction cups on the bottom that will hold it in place depending on the surface you have it on. 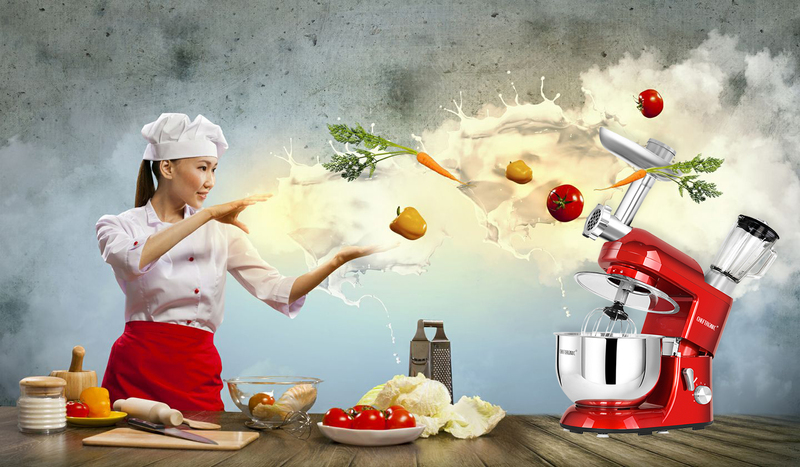 There are 4 different attachments that can be used with the mixer and what you are making. I hope with this and the attached video it helps in your decision. So far we are very happy with how it is working. I have always wanted a stand mixer, but didn't want to shell out the big bucks for the high end stuff. I found a review for this stand mixer on YouTube, and decided to purchase it with a discount code provided. The first time I set it up, I thought it was DOA as well, but it isn't. People are too impatient and don't try. To use this just as a mixer, you have to cover both the blending and mincing ports with the covers provided. Again, the instructions are minimal at best, but the mixer works! I've made 3 or 4 batches of bread with this and it has shown no signs of slowing down. With the heavier dough, the upper part does jerk a little, but that also happens with the high end stuff. The suction cups hold it down really well, and I've never had the actual unit move while mixing. I've not used the blender or mincing functions yet, but I can't wait to find out, and I'll update my review then. Cons: The beater attachment doesn't really scrape all the way to the bottom, but again, this happens with the other kinds of mixers. Can't really think of any other cons. I love the color, the design, and the shape and even though the exterior is made of plastic, I can feel that the interior is well made to last. Was my money well spent? For the deal I got?! Heck yeah!